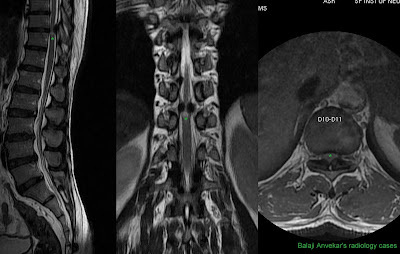 Sagittal T2, Coronal T2 and Axial T2w MRI images of Lumbar spine shows marked focal thickening / ossification of ligamentum flavum at D10-11, causing significant focal canal stenosis and cord compression. 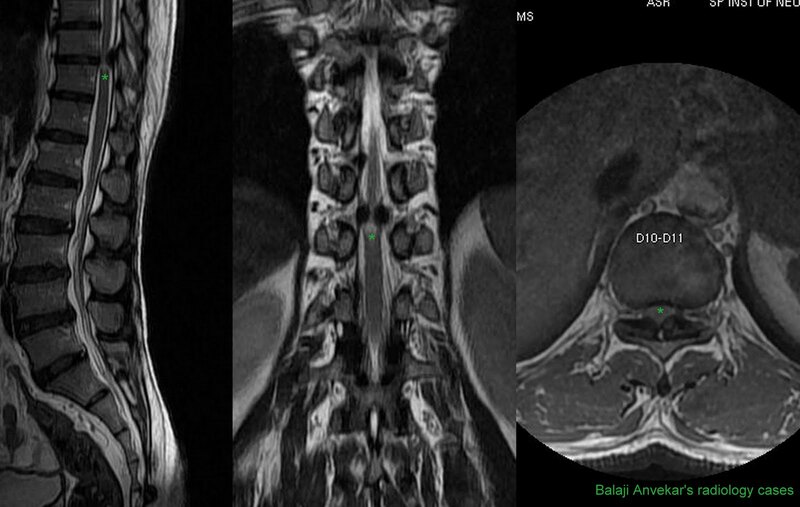 Compressed cord shows a focal abnormal intra medullary T2 hyper intensity. Mechanism of hypertrophy remains unclear. It is proposed that hypertrophy occurs due to chronic inflammation leading to accumulation of fibrous tissue (scarring) in the ligamentum flavum. Inflammation-related gene expression is found in the ligamentum flavum. It might be possible to prevent the hypertrophy of ligamentum flavum with anti inflammatory drugs. Reference : Ligamentum flavum hypertrophy due to accumulation of inflammation-related scar tissue; Sairyo K ; Spine (Phila Pa 1976). 2007 May 15;32(11):E340-7.